While using a great protectant like Wolfgang Deep Gloss Paint Sealant 3.0 will enhance the look of your paint, the key to a great shine is in the prep work. The protectant is actually the last step to that great looking shine. Your car's paint is bombarded by contaminants and assaulted by foreign objects every day. These are the things that make your finish look less than perfect and can't be avoided if you want to drive your car. Polishing your car removes defects like swirl, etching, scratches and oxidation while enhancing gloss and preparing your car for the protection it needs and deserves. For all of these types of defects there are different types of polish and pads to use with your Dual Action Polisher. Step 1) For moderate to severe damage, scratches, heavy swirl and other more serious defects, you would want to use the Orange Light Cutting Lake Country CCS Foam Pad, with Wolfgang Total Swirl Remover 3.0 and put your speed setting at 5 to 6. Step 2) When it comes to normal swirl, light to moderate oxidation, water etching and light scratches, you would need the White Polishing Lake Country CCS Foam Pad with the Wolfgang Finishing Glaze 3.0 with your speed setting set at 3 to 5. Step 3) If you don't have much as far as damage but want to enhance gloss and prepare a nice clean surface for your protectant, you would want to use the Green Polishing/Finishing Lake Country CCS Foam Pad and Wolfgang Paintwork Polish Enhancer with your speed set at 1 to 3. 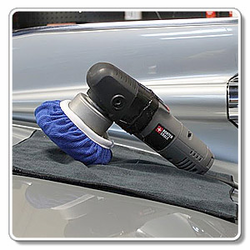 Although you can polish your paint by hand, all of these steps are most effective when you use a dual-action polisher like the Rupes LHR 12E Duetto Random Orbital Polisher or FLEX XC3401 VRG Orbital Polisher because it can do the work your hand is simply not able to do. Don't forget, polish does not protect. It only improves the look. When you are finished, you will need to protect your work with a protectant or wax like the Wolfgang Deep Gloss Paint Sealant 3.0.